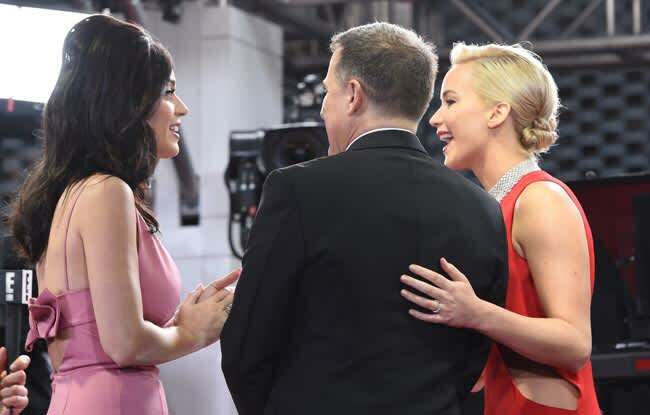 Katy Perry and Jennifer Lawrence met for the first time and it was beautiful | HELLO! January 11, 2016 - 14:10 GMT hellomagazine.com Can't.cope. Ryan Seacrest made superfan Katy Perry's dreams come true on Sunday night when he introduced the popstar to Jennifer Lawrence. Talking to the presenter on the red carpet at the Golden Globes, Katy was talking about tweeting her love for the movie Joy. As luck would have it, star of the film Jennifer was on hand to hear the compliment and introduced herself. The pair exchanged a hug before bonding over Katy's hairpiece. Yes, you read that right. Jennifer complimented Katy's voluminous hair style and the singer was quick to reveal it was a 'Bumpit' – a plastic hair accessory used to create volume at the crown. "I have a Bumpit in here, as seen on TV," she told Jennifer. After checking, the actress confirmed: "Yes, you do." It was a brilliant moment, guys. Katy went on to praise Jennifer for her role in Joy. "Yeah, I saw it alone by myself in Santa Barbara in my Victoria's Secret Pink sweats and I was like, 'I can make it in the world. You inspired me!'" To round off this beautiful exchange, Jennifer said: "Oh honey, you already made it."